Play a round of golfing fun and games with friends on the fairways. Create your golfer, grab your clubs and level up your swing skills with easy to learn controls. Hop into a golf buggy to zip across the open courses – or relax by the water hazards for a spot of fishing between holes. Hit the bogeys and birdies online or go it alone in matches, tournaments, missions and mini-games discovering new secrets with every stroke. This is the golf game for everyone where fun, laughter and excitement are par for the course. Hit the greens in 4-player offline matches, or with an unlimited number of players online. Live the golfer’s life and customise outfits, monitor stats and unlock new features. Perfect your putting, develop your drive and sharpen your back-swing as you improve your skills with easy to learn controls and techniques to master. Everybody's Golf is a great golfing games. I don't normally play sports games but this has provide many hours of fun. 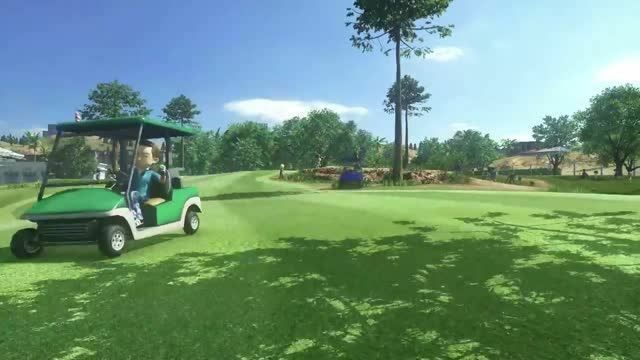 Everybody's Golf is a burst of Japanese exuberance. Full of strange voice acting, bright colours and wacky humour. But underneath of the fun is a great golf game to while away the hours, either by yourself or in co-op mode with a friend/family member. The loading screens can drag a bit, but once you are in a game, playing a round of golf, the game moves at a lighting place. There is never a dull moment to be had. The game also supports the PS4 Pro with a full 60fps and HDR mode to even more be able to admire the games shiny visuals.